Spring is already here and we're ready to wear open shoes, cute sandals and stylish thongs :) But are our feet ready for this show off? Not many people (men and women both) are successful to stick to their usual foot care regimen during cold winters. The reason may be just chilly weather or other issues like skin allergies arising due to low temperature. As a result, the feet tend to become dry-skinned, itchy bearing cracked heels. The most common foot care product in anybody's list would be a foot care cream, but make sure you start by exfoliating your feet. 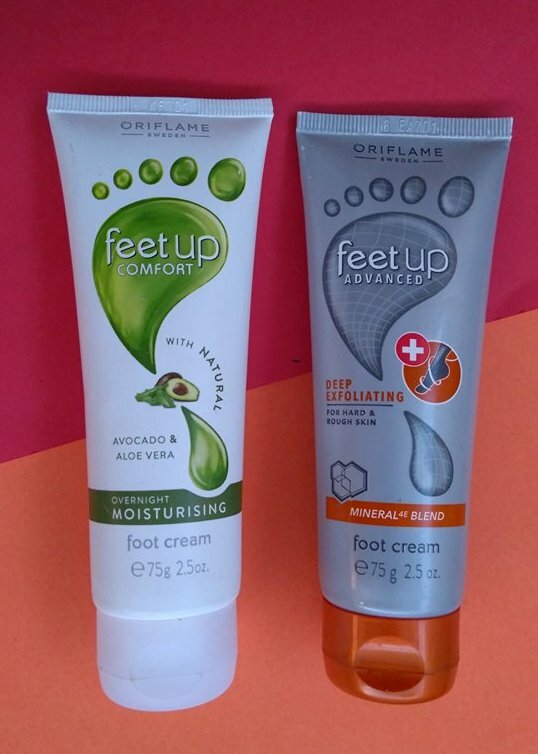 I'm currently using Feet Up Deep Exfoliating Cream and Feet Up Overnight Moisturizing Cream from Oriflame that help me keep an eye on my feet's health. Exfoliating your body skin is a good skin care practice and your feet are no exception. Scrub away rough, dry skin with Feet Up Deep Exfoliating Foot Cream. 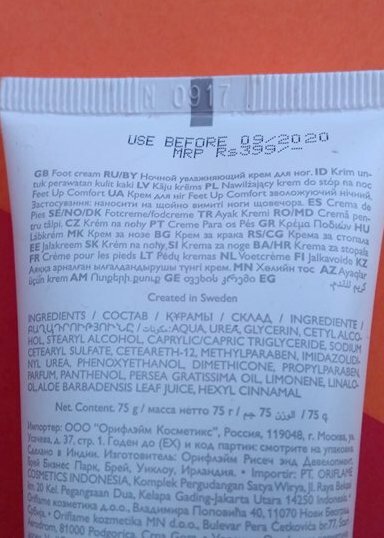 This high performance, rich, creamy rinse-off foot scrub with natural origin Pumice beads, Mineral 4E Blend and nourishing Shea Butter effectively exfoliates, purifies and conditions hard, rough skin to leave your feet soft and buffed to perfection. Feet Up Exfoliating cream is a soft-smelling, white-colored cream that has micro Pumice beads in it. I start by soaking my feet in plain lukewarm water and smoothen the sole of my feet using pumice stone. Once the skin feels little softer, I massage the exfoliating cream focussing on the drier areas like heels, toes and balls of my feet. Wash the cream off after the product does its job through a light massage. The exfoliator cream is a blend of four minerals Copper, Zinc, Iron and Magnesium that have ultimate benefits for skin repair, softening and smoothening. 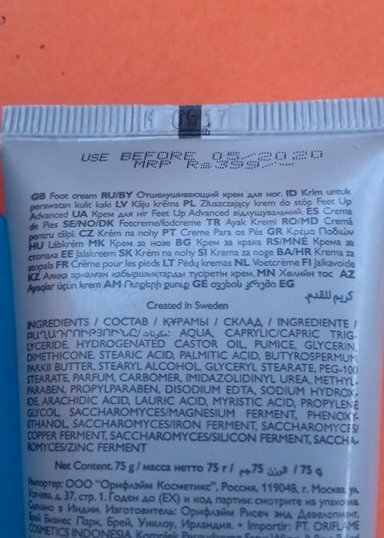 This cream not just takes dead skin off instantly but helps avoid building tough calluses and clogging of pores. I could see my feet untanned and healthier-looking right after the first use which is worth all the applauds. A nourishing massage after the exfoliation is always a must, be it your face, body or feet. Wrap your feet up in the creamy richness of this intensely moisturising overnight cream. 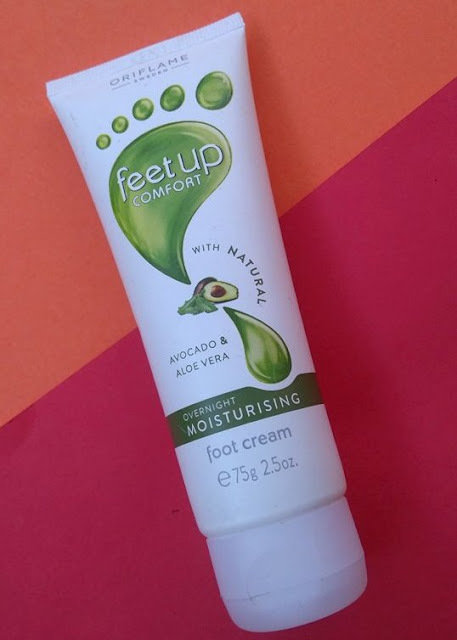 Infused with natural extracts of Avocado & Aloe Vera, Feet Up Overnight Moisturizing Foot Cream will soften even the toughest skin and help to soothe tired feet while you sleep. Massage into feet at night and wake up the next morning to find them improved. Feet Up Overnight Moisturizing Cream is advised to be applied before bedtime and to be left overnight on your feet. But I don't mind availing its benefits after a scrbbing on my feet. It's a mildly fragranced, white-coloured cream that is ultra-hydrating on my dry skin. 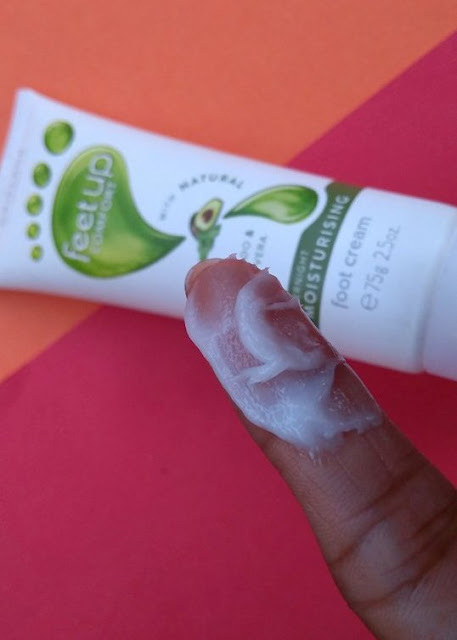 Though I apply only little amount of the cream, it makes my feet super soft to touch and I'm totally loving that feeling. The power-packed protective antioxidants and fatty acids, Avocado oil has outstanding regenerative properties that helps to heal cracked heels when used on everyday basis. 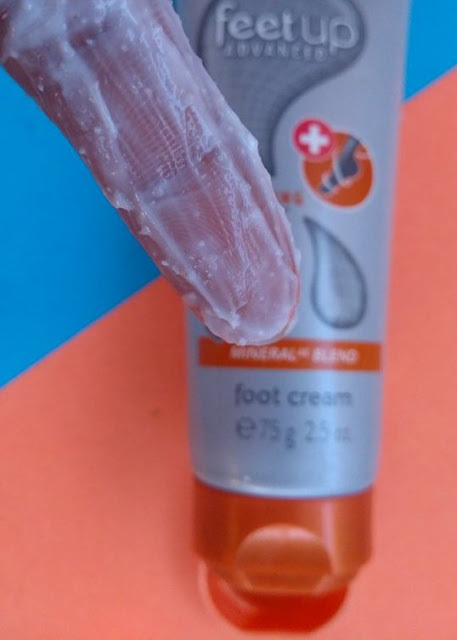 Due to it's deep penetrating capability, it carries the hydration into deeper layer of rougher foot skin and gives result as we want without feeling greasy. 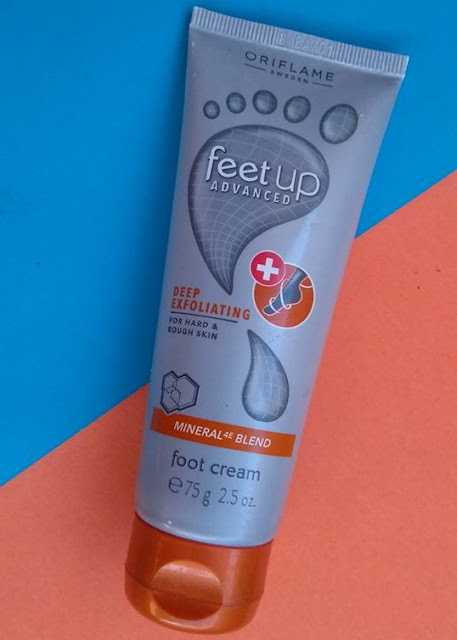 This combo of Feet Up products is an ideal pick for those who care for their feet equally as they do for their body. When used on a weekend, it's a perfect pampering for my tired feet after a long hard week at work. It also helps me relieve the pain and inflammation I usually have on my feet. And the bonus points for making my feet smell nice. Both the Exfoliation and Moisturizing Foot Creams are priced at Rs. 375 each for 75ml. I recommend the result-oriented Oriflame Feet Up product range to ease your aching feet coz healthy feet are happy feet! Both these products are really good. My mom also liked using the cream.